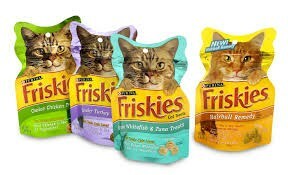 Friskies is a brand of cat food. It is owned by Nestlé Purina PetCare Company, a subsidiary of Nestlé. This brand is offered as a canned soft/wet food, as well as dry food (i.e. kibble). Flavors include poultry, beef and seafood.